AKARI, the infrared satellite of the Japan Aerospace Exploration Agency (JAXA), is reportedly doing well, sending back images of the known universe using infrared cameras. 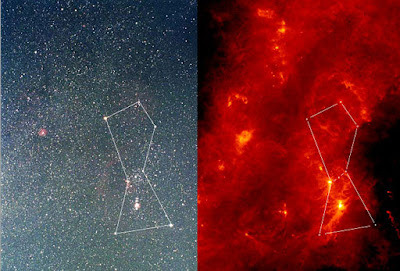 It has given us stunning views of commonly-viewed sky objects like the constellation of Orion, here shown in visible light (left), and in infrared (right). Notice how nebular structures are shown in greater detail. See the nebular ring surrounding the star (actually, it's a trio) that represents Orion's head, on top in the infrared snapshot? What do you think caused it?